For the 18th year in a row, Brisbane Rotarian Denise Schellbach is operating Eddie's Van on weekdays during January. Eddie's Van is a project of St Joseph’s College, Gregory Terrace ( Eddies' Van - 17 years and still going strong ) and during the long school holidays Denise gives staff and students a break by operating the van with the help of members of the Rotary Club of Brisbane and other friends. The Rotary Club of Brisbane is pleased to call for applications from people who will be aged between 18 and 27 in May 2019 to attend the 2019 Rotary District 9600 RYLA training seminar, fully sponsored by the Rotary Club of Brisbane. The 2019 Rotary District 9600 RYLA training camp will be held from May 4th to 10th 2019 at Luther Heights Youth Camp at Coolum Beach, an engaging venue with ocean views and friendly staff who are dedicated to creating the best opportunities and experiences for you. Transport to RYLA will be facilitated via bus, departing Brisbane Saturday morning and returning Friday evening. Interested candidates should get in touch with Mark Williams, Rotary Club of Brisbane secretary, before submitting a Motivation letter and a short CV to be considered. 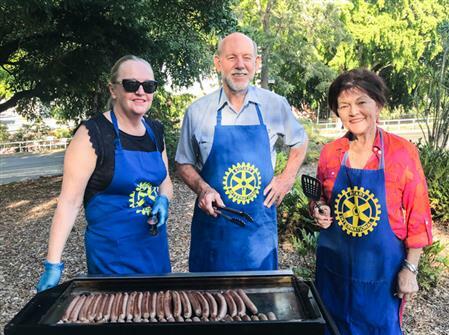 Applications to the Rotary Club of Brisbane should be lodged by Friday, 15th February, 2019. Rhys Williams (photo above) was one of the RCoB's sponsored attendees at RYLA 2018 and he recently reported to the club on his experience. Rhys was very positive about the motivational atmosphere and content of the RYLA camp, and reported that after 6 months, several of the learnings had stuck with him and impacted his life. 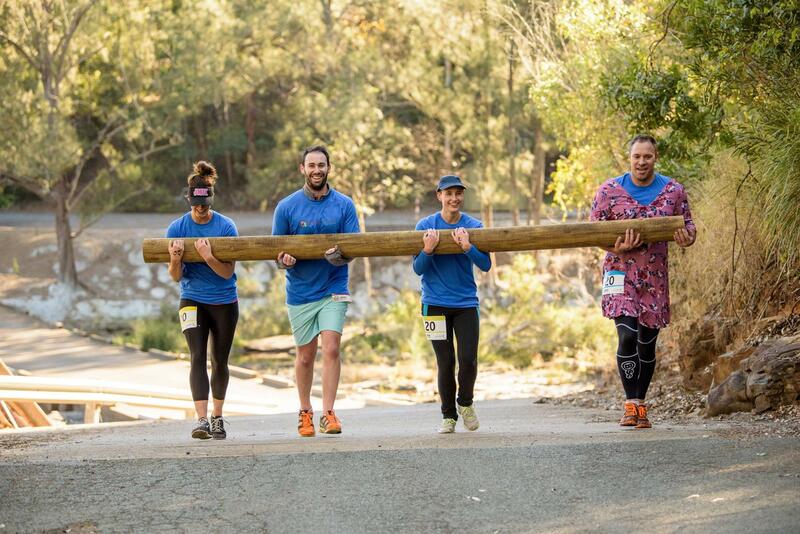 Life must be hard in the financial planning industry, because our very own Luke Marshall recently took a break from it to compete in the Canungra Challenge, a gruelling exercise based on the torture undergone by our service men and women in training to serve our country. It represented an opportunity for civilians to put the JPs on the other feet, so to speak, and serve the families of service personnel who have seen active service by supporting Legacy Australia. Luke wore a tasteful floral number to the Canungra Challenge. 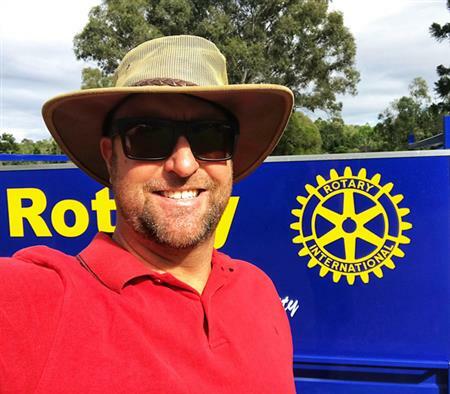 The Rotary Club of Brisbane Charity Golf Day was again held in fine sunny weather at the Virginia Golf Club this year on 15th June, the course was in good condition, and fairways were a bit more forgiving. quality of greens was generally good. The club’s golf co-ordinator, Andrew Halliday had all the necessary paperwork and sponsors' banners in place, motorised carts all individually named, with the help of John Smerdon selling raffle tickets and myself attending to the registration of players, the pre-game issues of the day were quickly attended to. Breakfast was served, bacon and egg muffin with coffee, and players were briefed on the day, its purpose and method of scoring. The clubs golf co-ordinator then identified where the special prize holes were, advised there was a map of the course on scorecard and then directed the field to the respective start holes. This year we again had a grand raffle as well as our multi draw prize table with some great prizes. Rotarian Georgina Bishop for providing two beautiful bangles which would have pleased some players mother, girlfriend or partner when they got home, one was on the raffle table and one was allocated for ladies nearest the pin. Rotarians: Michael Stephens, John Smerdon, Don O’ Donoghue, Gerald Holtmann, Graeme Whitmore all of these members provided cash donation’s, I sincerely thank them for their generosity and financial support to our day, where practical these cash contributions were paid into a PAF for future use, and finally to Price Line Pharmacy ( James Delehunty) & Jacqueline Page ,for raffle prizes. This year we also received cash donations from persons outside the club, and they included Mr Paul Wall, Mr Derek Morell, & Mr Earl & Marg Ryan, these have been acknowledged by the issue of certificates which have been delivered or posted. This year we keep the day to a Friday morning, hoping that this would increase the numbers along with a return to Virginia Golf Course. Attendance this year was better, with 59 players finally teeing off, the good thing is that we only had one defection, and mor importantly ten ladies were in the field. The challenge for day was a four-person Ambrose event, with a special double Perrier system of handicaps. This makes the scoring fair as the handicaps for the day are taken on six hidden holes selected by the club. This was the second time in eight years that I have played and was intending to defend our teams title, but alas it was not to be. Part of last years’ winning team with some new players (two ladies) teamed up, and were close but not quite there, although they took out a few of the major prizes. Most importantly, a good day was had by all and in excess of $8000 was raised for doing good in the world. 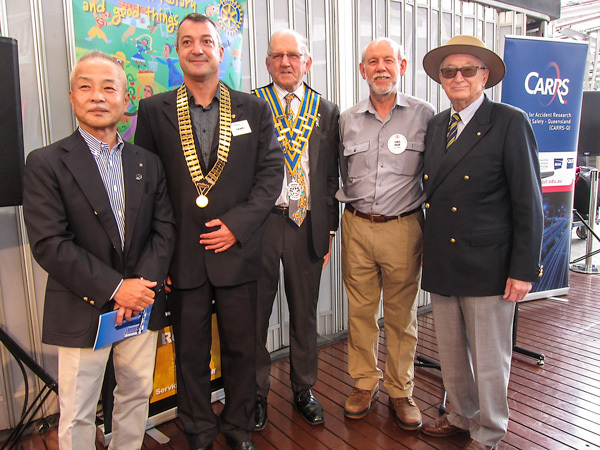 The Rotary District 9600 Changeover event took place on the 17th of June at the Old Petrie Town. Past District Governor John Lane reported on a very successful Rotary year with numerous achievements as examples before passing the collar to District Governor Wendy Protheroe. 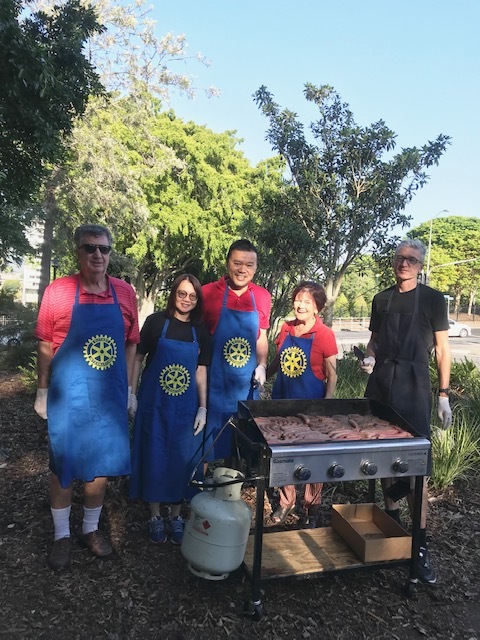 The Rotary Club of Brisbane was the only Club to get two awards at the event: the Alan Ward Memorial Shield for outstanding activities in vocational service and the Herrington Shield for best club bulletin. 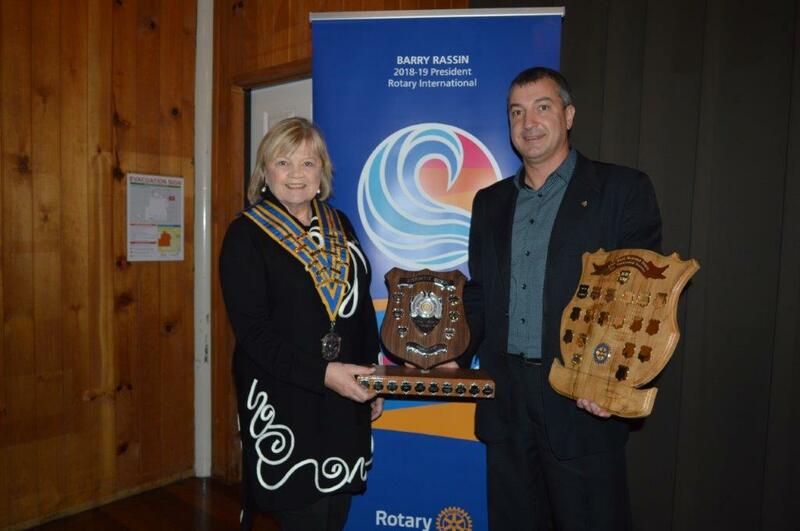 Rotary Club of Brisbane President Daniel Vankov with the two trophies, the Alan Ward Memorial Shield and the Herrington Shield, at the Changeover event together with District Governor Wendy Protheroe. The Rotary Club of Brisbane was chartered on the 29th of May, 1923, becoming the third club in Australia after Melbourne and Sydney. We celebrated our 95th anniversary one day early in the Queen St. Mall on 28th May. Since it was not a major anniversary, the celebrations were low-key, but nevertheless it was an important event for the club both in terms of the visitors who came to celebrate with us and the culmination of a significant service project. (From Left) Visiting Rotarian from Kobe East Masaki Sawada, Pres. Daniel Vankov, DG John Lane, Pres. Elect Chris Muir and Past President Keith Watts at the 95th Anniversary Celebrations. 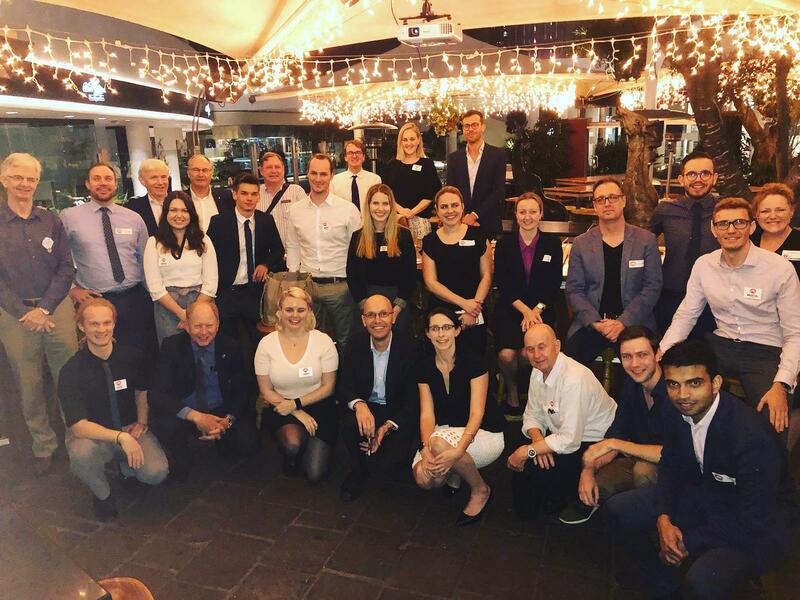 On the evening of May 2nd, The Rotaract Club of Brisbane Rivercity held the culmination of a multi-week professional development workshop at the Pig'N'Whistle. The focus of the workshops were three skill areas particularly valuable to young professionals - interview skills, public speaking skills and conflict management skills. To that end, Rotarians attended meetings of Rotaract Rivercity over a number of weeks to impart theoretical knowledge in these three areas, and then on the evening of the 2nd May, about a dozen Rotarians from the city cluster clubs, including RCoB's own Luke Marshall and Mark Williams came together with Rotaracters to put the icing on the cake with practical exercises. Cluster Assistant Governor Lisa Bateson was also present, underlining the importance of the event. 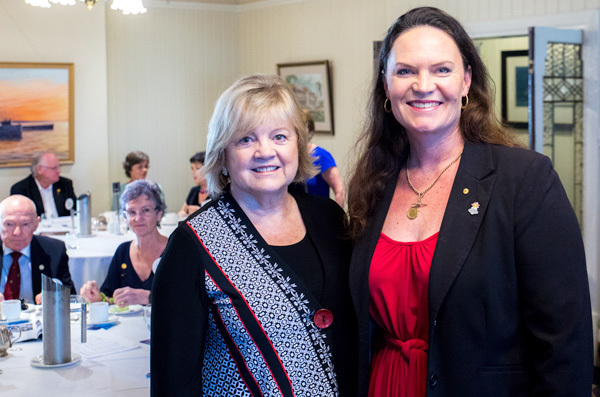 Each year our speaker coordinator Denise Schellbach organises one or two "special event" speaker meetings at the United Services Club for the RCoB, other city clubs and invited guests from the general public. 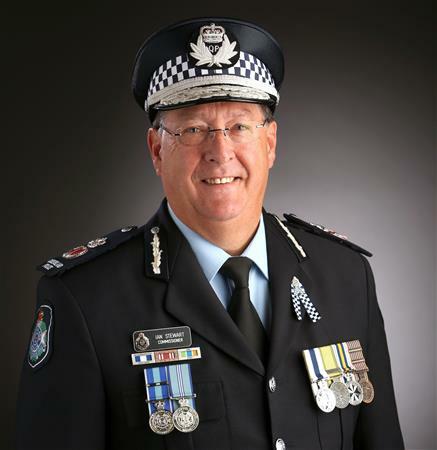 For the last couple of years Police Commissioner Ian Stewart has featured to acclaim. 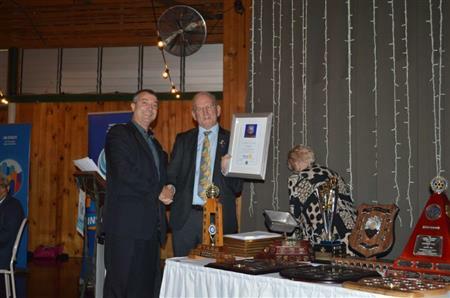 This year was again a sell-out function with over 90 Rotarians and guests attending. Police Commissioner Ian Stewart gave an entertaining address on "Project Sentinal" and security around the Commonwealth Games. 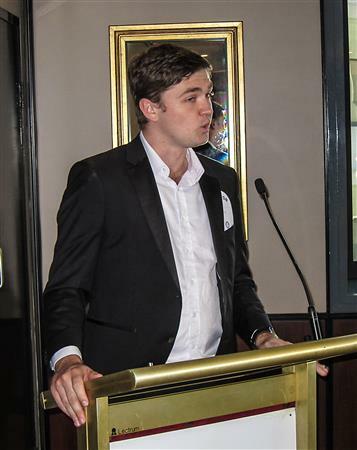 The United Services club once again did us proud with the lunch, service and venue and President-Elect Chris Muir did a great job as last-minute emergency MC. Many thanks Denise for all the hard work that went into this event. It was a corker! 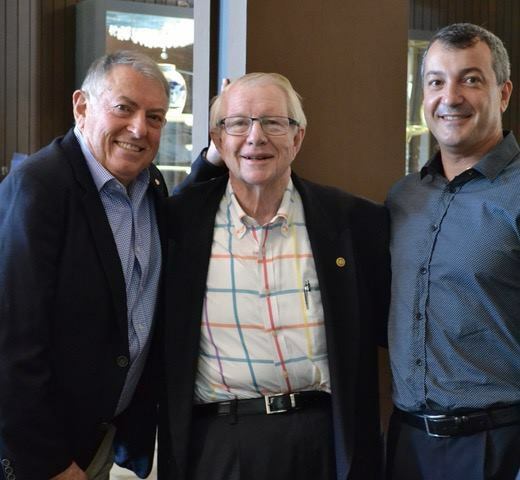 Sunday 29th April saw 134 guests including about 50 members, past members, family and friends of the Rotary Club of Brisbane converge on the Victoria Park Golf Club Ballroom to celebrate 46 years of hard Rotary-ing by one James "Dela" Delahunty in a testimonial "roast" luncheon. 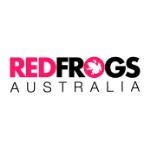 The event was held to support the Donations in Kind programme of Rotary in Australia which ships serviceable furniture, equipment and supplies that are no longer needed in Australia to destinations such as Papua New Guinea, and the Solomon Islands that have need of them. To date, thousands of containers of goods worth an estimated $52M have been shipped. RCoB 95th Anniversary Celebration - Save the Date! The Rotary Club of Brisbane was chartered on the 29th May, 1923. 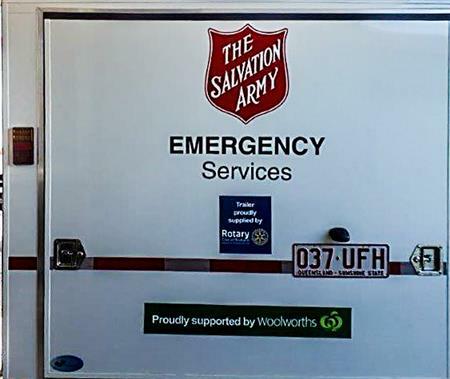 We will be celebrating that event in the Queen Street Mall stage area at 11am on the 28th May with the official handover of a mobile kitchen trailer built with a grant of $30,000 raised by the Rotary Club of Brisbane to the Salvation Army. 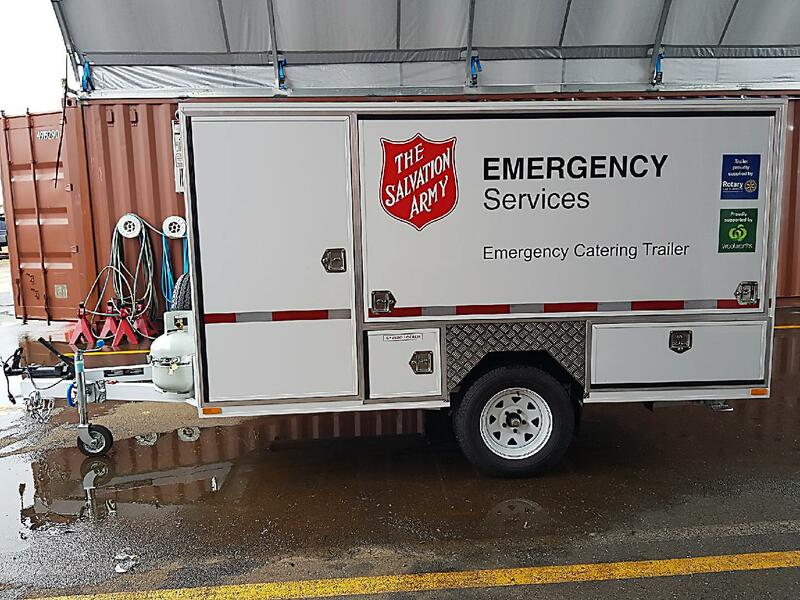 The Salvation Army Emergency Services runs a small fleet of emergency trailers that are positioned around Queensland for early response to natural disasters and other emergency events. Please join us in the Queen Street Mall on the 28th May for this and other celebratory activities. 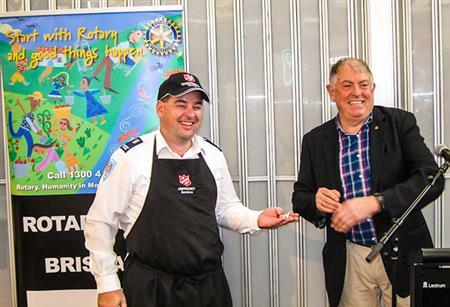 $30,000 Mobile Kitchen donated by the Rotary Club of Brisbane to the Salvation Army Emergency Services. 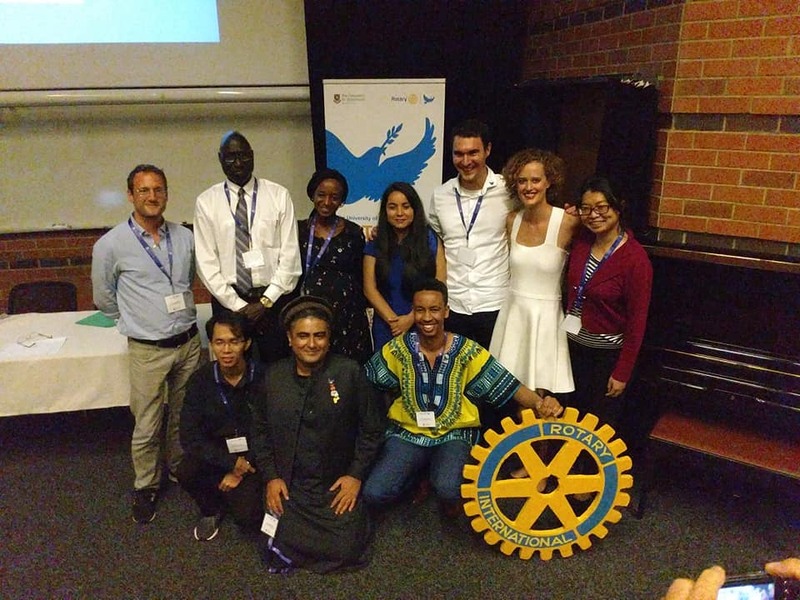 The Class of cohort XV presented their studies and Applied Fieldwork at The Rotary Peace Fellows Seminar on Saturday 24 March, 2018 at The University of Queensland. Topics ranged from Building inclusive communities, Columbia national and local peace, Modern slavery in the 21st century, The current situation and future of humanitarian action, Deconstructing bias in international development and how to apply to become a Peace Fellow. 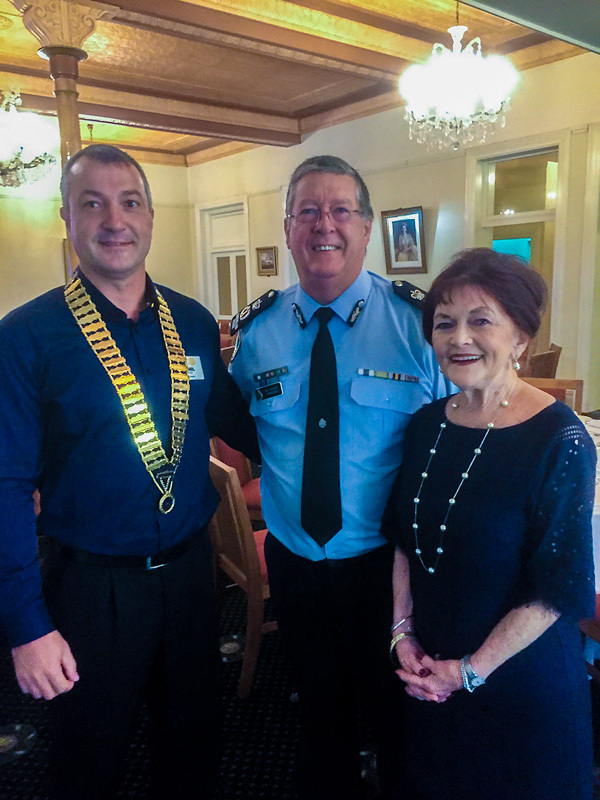 Queensland Commissioner of Police Ian Stewart has been generous with his time in the past, and this year we are honoured that he will address a meeting of the Rotary Club of Brisbane that is also open to Rotarians from other clubs and like-minded members of the public. The meeting will be held at 12:00 for 12:30 on Monday, 14th May 2018 at the United Services Club on Wickham Terrace. 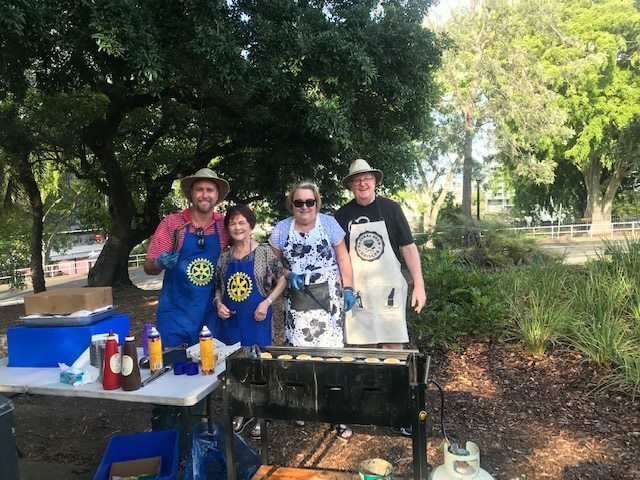 The Rotary Club of Brisbane was, is and should continue to be the motor behind major community initiatives in Brisbane, Queensland, Australia and beyond. Our duty as members of the Club is to ensure that it will not only continue to that but also to expand its impact. It is not easy to identify key strengths and weaknesses on which we can build. For a human a simple mirror does the job but for an entity it is hard to observe from the inside. We had to create proper mirror for the Club to have a look at itself. During the past week or so, Rotary International President Ian Riseley has been in his home country of Australia. The main event for the trip was the Rotary International Presidential Peacebuilding Conference held in Sydney, but we were lucky enough to have him in Queensland for a few short days before he boarded his plane for Singapore and points beyond. 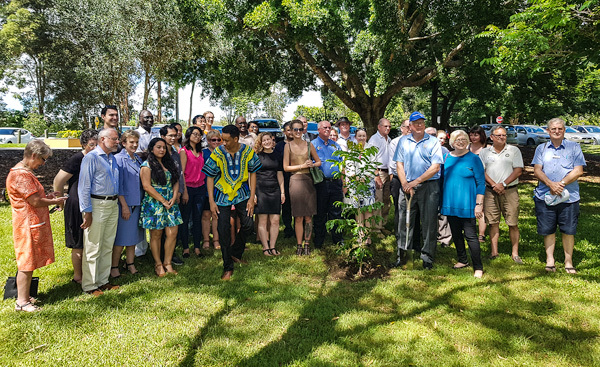 Rotary International President Ian Riseley (with shovel), PDG Juliet (at his left) with participants in the tree-planting ceremony. Rotary Club of Brisbane Golf Day - It's On Again! 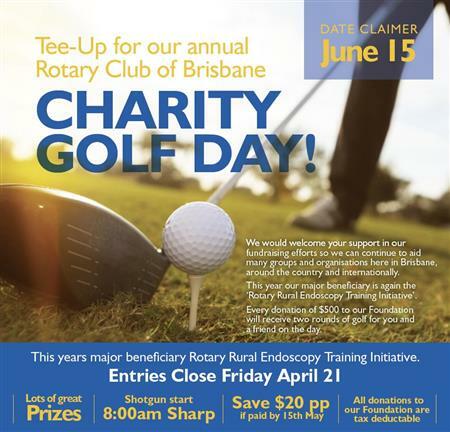 The 2018 Rotary Club of Brisbane Charity Golf Day is on again, on Friday June 15. 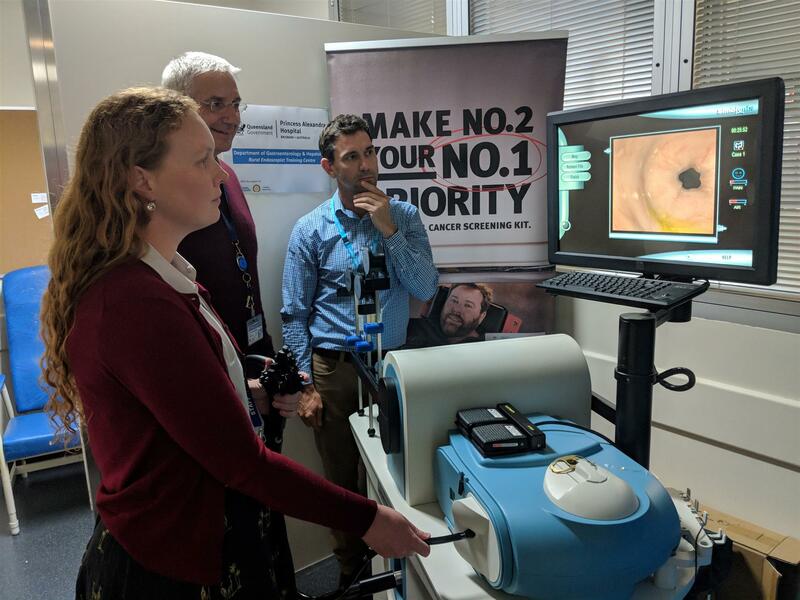 This year, proceeds will go to aiding our ongoing project to help train rural medical practioners and nurses to perform endoscopies so that patients do not have to travel to large cities to have these procedures. Click on the image below to get your entry form now! This is a special date claimer for a luncheon on Sunday 29th of April 2018. Click on the Image above to reserve your Seat! This is your chance to get your two bobs worth in but there is a small catch and it's for a great purpose! 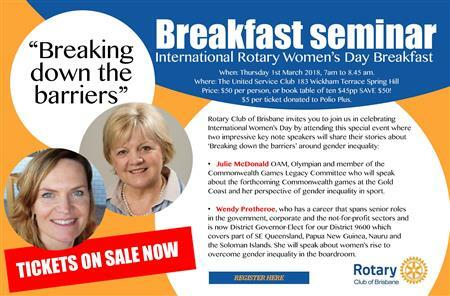 The Rotary Club of Brisbane held its inaugural Rotary International Women's Day Breakfast Seminar with the theme of "Breaking Down the Barriers" at the United Services Club on the 1st of March. The seminar was well-attended with a total of 41 attendees including our 2 keynote speakers, 14 RCoB members and 7 Rotarians supporting us from other clubs including the Brisbane Mid City, Pine Rivers Daybreak, Brisbane Planetarium and Fortitude Valley clubs, one UQ Rotary Peace Fellow and a goodly leavening of guests and other people interested in the theme of the event.